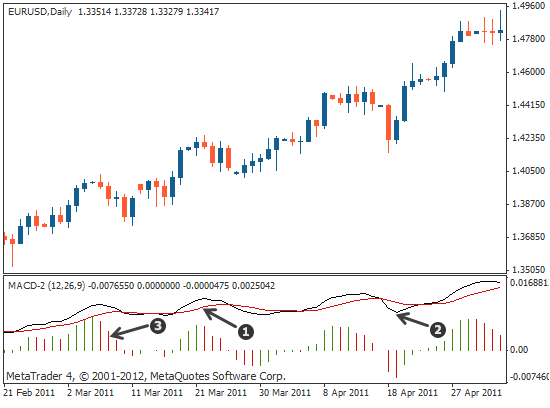 Moving average convergence/divergence (MACD) is mostly used as a trending indicator, but it can also be used as an oscillator as well. It helps you decide what direction the price may move in, how strong that movement may be and when a trend is likely to change. 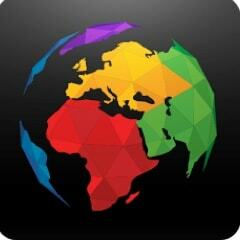 It gives you the possibility of entering a trend just as it starts and exiting one just before it finishes. 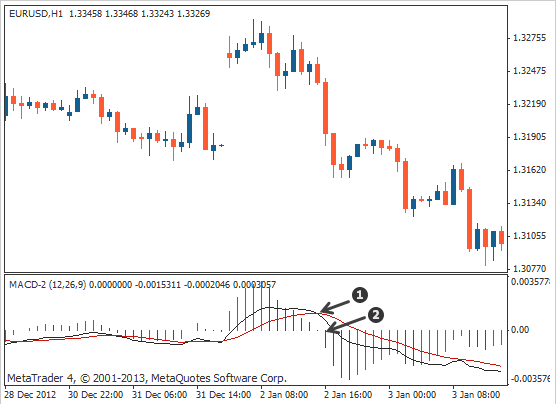 The MACD is mostly used as a trending indicator, but can also be used an oscillator as well. It helps you decide which direction the price can move in, how strong that movement may be and when a trend is about to change. 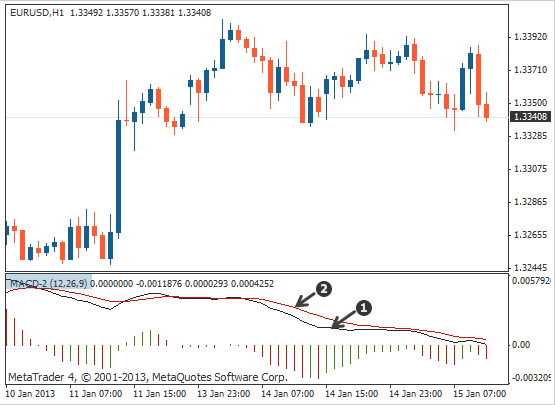 The MACD indicator comprises three separate readings, which appear together in a box underneath the price chart: a MACD line, a signal line and a histogram that shows the difference between the two lines. The black MACD line is a moving average type line that tracks the underlying asset's price. The red signal line is a moving average of the MACD line itself. It smooths out the movement of the MACD line and interacts with it to produce trading signals – we show you how to interpret them later in the lesson. 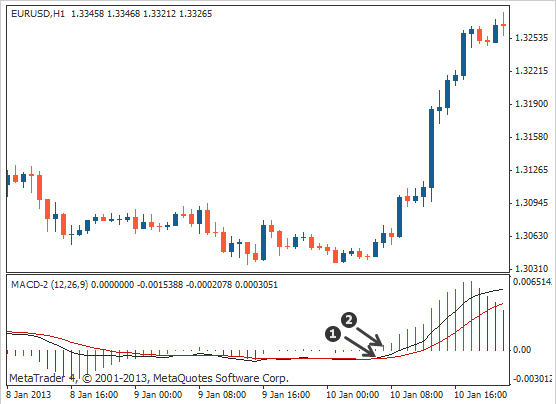 The MACD line is a moving average line that tracks the underlying asset’s price. 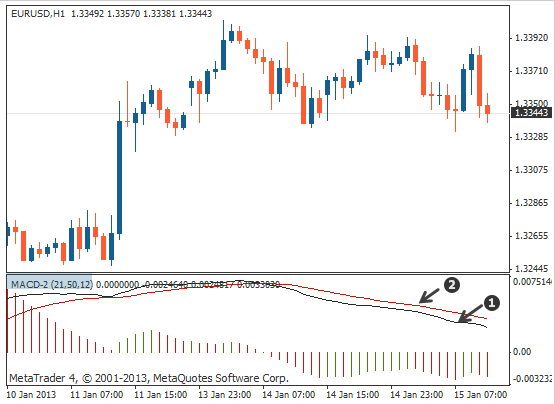 The signal line is a moving average of the MACD line and interacts with it to produce trading signals. The difference between these two lines is displayed by the histogram. This features bars that appear either below or above a horizontal zero line. It tells you how much momentum a price move has. This helps you recognise when a trend is gaining strength and when it may be about to run out of steam. 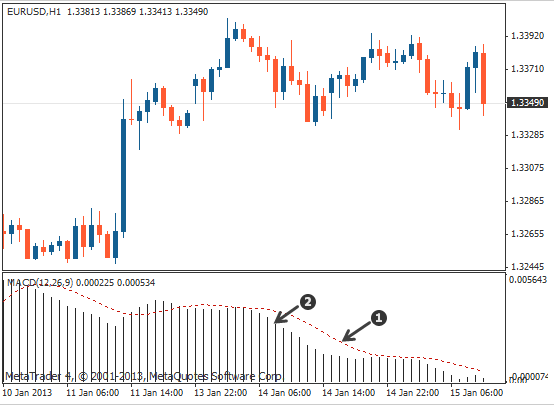 The histogram shows the difference between the two lines and indicates the momentum behind a price move. 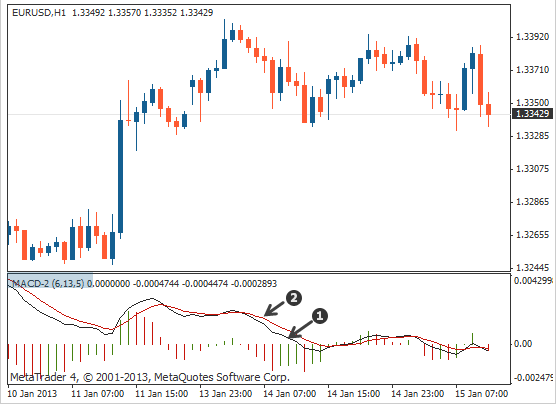 The standard MACD indicator is different within MetaTrader 4 (MT4). Only the signal line and the histogram appear on the indicator – the MACD line itself is not shown. A signal to sell is when the MACD has crossed below the Signal line. The signal is stronger if the histogram bars are also below the zero line. If the MACD crosses down below the Signal line, but the histogram has not confirmed it by producing bars below the zero line, this is still considered a sell signal, but not as strong. If the bars on the histogram are below the zero line and the signal line crosses down below the MACD line, this suggests prices may fall – a signal for you to sell. A buy signal is given when the the MACD crosses above the Signal line. If the histogram is above the zero line, then the signal is stronger. If the MACD crosses above the Signal line, but the histogram does not confirm it by having its bars above the zero line, this also gives you a buy signal, but not as strong. If the bars on the histogram are above the zero line and the MACD crosses up above the Signal line, this suggests prices may rise – a signal for you to buy. The MACD indicator's standard settings are 12, 26 and 9. You can however adjust these settings to alter how quickly the indicator reacts to price action and how often it gives you trading signals. Increasing the settings will slow the signals down, preventing false signals but also meaning you may miss the start of genuine moves. You can see that there are fewer trading signals. Decreasing the indicator's settings has the opposite effect, making the indicator more sensitive so that it gives you more signals, but can also result in more false ones. If you do decide to change the indicator's settings, it is important that you check your changes are improving your trading results, logging and comparing any profits or losses you make from the same trading strategy under different indicator settings. … moving average convergence/divergence (MACD) is a trending indicator. … it can help you decide when to buy or sell an asset, enabling you to enter trends as they start and exit them before they finish. … the MACD line is a moving average line that tracks the underlying asset's price. … the signal line is a moving average of the MACD line and interacts with it to produce trading signals. … the histogram displays the difference between the MACD and signal lines and indicates the momentum of a price move and when it may be about to end. ... buy and sell signals are given when the MACD line moves above and below the signal respectively. … the histogram revolves around the zero line – bars below the signal line indicates downward momentum and above the zero line indicates upwards momentum. … increasing the indicator's settings slows down its reaction so that it produces fewer signals – this reduces the risk of false signals. … decreasing the indicator's settings speeds up its reaction so that it produces more signals – but raises the risk of false signals.